Yes, what you see is what I believe. Under starting quarterback Brian Hoyer last fall the Browns went 3-0 before Hoyer suffered an ACL tear. 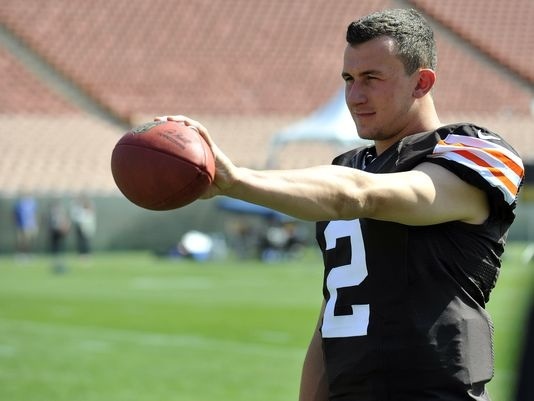 With the 22nd overall pick this last spring the Browns selected Texas A&M’ phenom quarterback Johnny Manziel. We’ll see whether Manziel sits under Hoyer or takes the starting position. With a good defense and an offense ready for a good quarterback, I really believe this is THE year in Ohio. The city is ready for a return to the playoffs. With Hoyer and Manziel as a one two punch, and with a healthy defense, the Cleveland Browns are definitely a scary team in the AFC North. The Cincinnati Bengals haven’t won a playoff game in almost 25 years. With an identical roster, I don’t think this team is good enough for their division’s up and coming competition. After a terrible performance at home in the Wild Card playoff game against San Diego, I think its going to take time for Andy Dalton and the Bengals to get back to the dance. They have a good offense, but in my opinion, it’s nothing special and not good enough. This divisional I think will be the biggest surprise, and a let down to NFL analysts this season. The 2013 Super Bowl champion Baltimore Ravens struggled last season, but eventually gave themselves a chance that they blew in the final two weeks of the season getting outscored 75-24. Head Coach John Harbaugh and quarterback Joe Flacco had a legendary defense in the year they won the Super Bowl. Without that defense, I firmly believe this team isn’t even good enough to compete for a playoff birth. Last season they had an easy schedule and were lucky to be in any type of playoff race. They set themselves up for a wild card birth, but they still blew it. They did add Steve Smith this offseason, but until Joe Flacco can return to that great form and more improvements around the whole team, they won’t be headed anywhere. Former pro bowl running back Ray Rice will return in week 3 after he serves a two game suspension. The Pittsburgh Steelers are going to come across the realization that it’s time for some big changes after this season. After missing out on the playoffs in a heart breaking fashion last year, they aren’t going to have the same chance with this team. With other teams in the AFC getting better, this will be a real “Shift in Power” for the Steelers in the wrong direction. Mike Tomlin should be on the hot seat after their struggles. They are going to be in need of a better receiving core, and perhaps a young quarterback. Roethlisberger is 32 years old and so it wouldn’t be a bad idea to stock up on an understudy to Big Ben. Steel City, prepare for a major let down this upcoming season.